Veteran actress Dimple Kapadia is celebrating her 60th birthday today and wishes have been pouring in for her from all across. 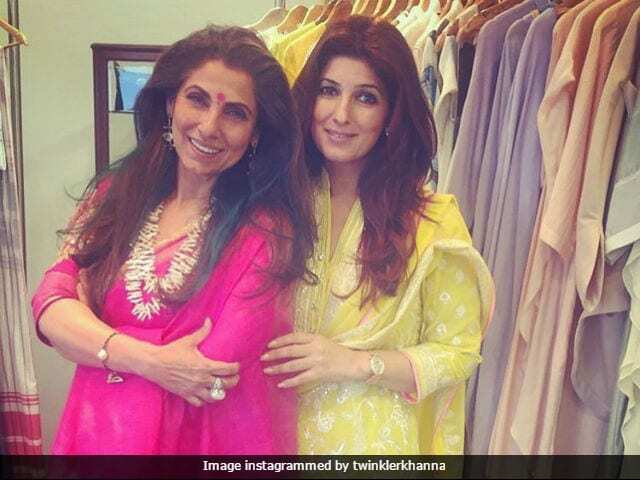 Celebrities including Dimple Kapadia's daughter Twinkle Khanna extended their best wishes for her on social media. The 43-year-old actress posted a wonderful picture with her mother along with a heartfelt message on social media. "Happy birthday to the most beautiful woman in the world inside out! #birthdaygirl (sic)," wrote Twinkle Khanna. Indian designer Abu Jani also shared a picture of his 'forever muse' on Instagram and wished her 'the most blissful birthday.' Dimple Kapadia is currently in London along with Twinkle Khanna, Akshay Kumar and their children Aarav and Nitara to celebrate her birthday. Ace photographer Dabboo Ratnani also shared a beautiful picture of Dimple Kapadia extending his best wishes to her on her birthday. Dimple Kapadia started her career at the age of 16 with the iconic Raj Kapoor film Bobby (1973), co-starring Rishi Kapoor. The film won her the Filmfare Award for Best Actress. Soon after making her acting debut, Dimple Kapadia married actor Rajesh Khanna and took a break from acting for over a decade. Dimple Kapadia has two daughters - Twinkle and Rinke Khanna. In 1984, she returned to the film industry after her separation from Rajesh Khanna. She later featured in films like Kaash, Drishti, Rudaali, Dil Chahta Hai, Pyaar Mein Twist, Dabangg and Cocktail. She was last seen in 2015 movie Welcome Back. Dimple Kapadia's birthday coincides with actress Shilpa Shetty's, who turns 42 today. Happy Birthday, Dimple Kapadia and Shilpa Shetty!